Books are the most subjective of objects. For all the facts they contain, for all the journeys their stories can take you, your books are your own, and your bookshelf is a reflection of yourself. To be without books is like being without music - incomprehensible. The act of parting with a book is a sacred process – it is deliberated, decided, and is given away or sold. Throwing a book away? That’s just not something a civilised person would do, worse than burning a flag. That book could have been for someone, if it wasn’t right for you. I began this year by providing a dozen books to a lending library-type station at my father’s work – half-way through the week, half of them had already been picked up. Good luck to their readers. When the minimalism guru Marie Kondo, in both her book “The Life-Changing Magic of Tidying,” and her Netflix series “Tidying Up,” recommended you should keep only thirty books as, “in the end, you are going to read very few of your books again.” When this number was repeated on BBC Radio 4’s “The News Quiz” recently, the audience surprised themselves with the seething sound they produced – a line was crossed. Kondo later clarified that thirty books was her personal preference, and not a target for everyone else, but the very thought of the subject hit a nerve. 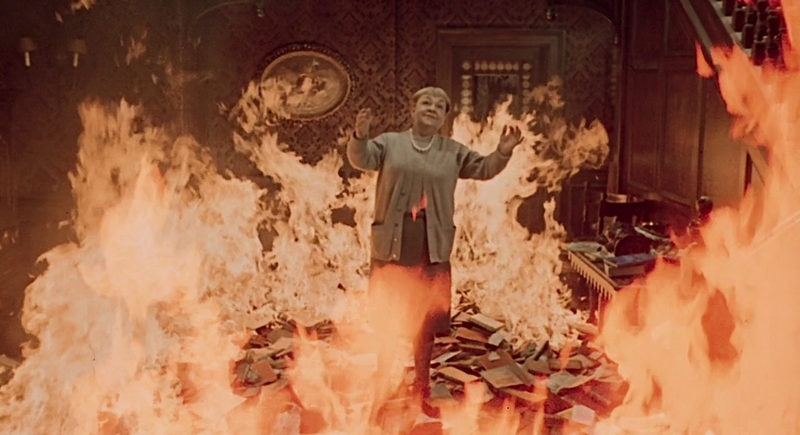 For me, a story about burning books came to mind, even if it was the film version of Ray Bradbury’s novel “Fahrenheit 451,” co-written and directed by François Truffaut in 1966. 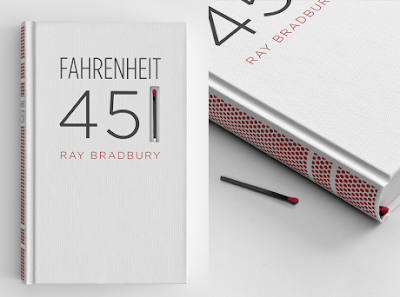 Bradbury had written the original novel in 1953, perturbed by the hearings of the House Un-American Activities Committee, led by Joseph McCarthy, and how they could lead to the burning of books – the title is derived from the temperature at which paper should start to ignite and burn, reflecting the political climate at that time. The novel has been subjected to censorship, over both its themes and use of swear words, leading to suppression in a few schools. The unthinking irony of an expurgated version being printed, only stopped when Bradbury was informed it had become the only version available, was not lost on the author, who considered himself to be a “preventer of the future,” instead of a predictor. Having a film made of “Fahrenheit 451” is in itself an irony, except when it is co-written and directed by a French New Wave director that set out to challenge the staid, literary nature of films made in the 1940s and 50s. It was the film critic François Truffaut, writing about the “certain tendency in French cinema,” that turned into Truffaut the “auteur,” his artistic vision in this film expressing itself on top of Bradbury’s story base. 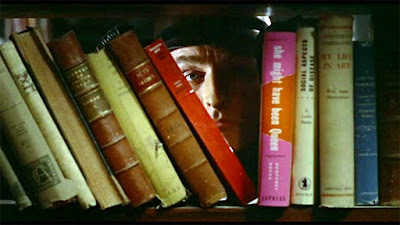 Despite this, Truffaut was a lover of books, and this film, where bettering yourself through books is a theme, was also about bettering his craft of filmmaking. From the startling opening title sequence, the written word is absent: after zooming pictures of TV aerials accompany the spoken opening credits, Truffaut’s camera is left free to document the insidious nature of the Firemen’s tasks in burning the books, from uncovering shelves from behind a TV screen, to setting up a brazier, to rehearsing the use of flame-throwers, and indiscriminately upturning people’s belongings in a park. This is a world where fireman Montag, the lead character, can say, “books disturb people – they make them antisocial.” When one person may be implicated, Bernard Hermann’s music takes a characteristically dramatic turn, and the screen size closes in on them, but when it is realised it is a false alarm, the techniques retreat. Truffaut also reverses the film to show one fireman putting on his fireproof clothes, as if to show how alien his job is about to become. 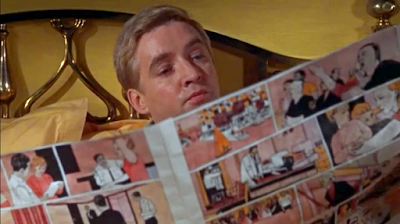 In a couple of scenes, Montag is shown reading a wordless comic strip – images can still form an idea, but the absence of written language prevents full expression, with all possible means. The most impactful scene is at the house of a book collector, where their entire house, contents and all, is to be burned – with the advent of fire-proof houses, firemen can only start fires. We go through the motions of the throwing of books into a pile, then being prepared to be burned. Their owner, given a count to ten to leave before the burning starts, will not leave. On “9,” she takes out a box of matches. The firemen’s leader has already said that everyone must all be alike, so they must burn all the books – the best thought is no thought. I can’t imagine a human being thinking that.